Update (7/5): Shine has been officially named  as Assistant to the President and Deputy Chief of Staff for Communications. 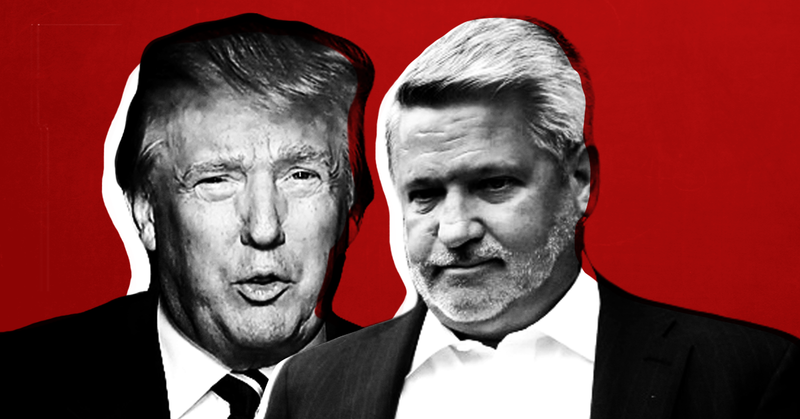 Donald Trump is reportedly close  to bringing aboard Bill Shine, Sean Hannity’s former producer and the former president of Fox News, as the next White House communications director. Shine has been repeatedly  implicated in the rampant sexual misconduct at Fox News. He played a similar role inside of Roger Ailes’ Fox News that Michael Cohen played for Donald Trump. As the senior executive vice president at the network, Shine reportedly retaliated against women who reported sexual harassment by then-CEO Roger Ailes and helped participate in covering up the reports that eventually led to Ailes’ ouster. Former Fox News reporter Rudi Bakhtiar was reportedly fired  from the network following her complaint that Brian Wilson, a former Fox News Washington bureau chief, had “made unwanted sexual advances toward her.” Bakhtiar reported the harassment, which Wilson denied, to Shine through her agent in 2007. Even though Shine reportedly promised to investigate, Bakhtiar was fired and eventually settled with the network for $670,000 through mediation after signing a nondisclosure agreement. Shine reportedly helped  Ailes interact with Laurie Luhn, a former Fox booker who eventually reported Ailes for harassment. Luhn had  a nervous breakdown after Ailes “psychologically tortured” her. Shine reportedly checked  her into hotels in different cities to keep her from reporting her circumstances and started reviewing her outgoing emails. A spokesperson for Shine told reporter Gabriel Sherman , who is now with Vanity Fair, that Shine denied reviewing the emails. The New York Times’ Emily Steel and Michael Schmidt reported  in 2017 that Shine refused to intervene when it became clear that then-host Bill O’Reilly would air a segment lecturing women about sexual harassment. While Shine was co-president of Fox News, 21st Century Fox reportedly  made  multiple payments to women who reported that Bill O’Reilly sexually harassed them. Shine was also  tied a racial discrimination and harassment lawsuit. A group of Black employees at Fox News sued  the network for racial discrimination and harassment. The lawsuit explained  that Shine "has demonstrated an obsession with race when it comes to discussions with [then-Fox News anchor Kelly] Wright, including regularly asking him, 'how do Black people react to you' and 'how do you think White viewers look at you?'" Also, Shine is  close  friends  with Sean Hannity, whose now-defunct show Hannity & Colmes he used to produce. When Shine left Fox News, rumors  swirled  about whether Hannity would invoke a clause in his contract to leave as well. Over 20 women have spoken out about Trump engaging in sexual misconduct, including 12 nonconsensual physical encounters. The media has for the most part  repeatedly forgotten about them, even though there is audio of Trump bragging  about sexual assault. And oh yeah, Sean Hannity and Fox News led the charge  to discredit the women in the first place. Trump’s racism is obvious, and yet it frequently gets papered over . Right-wing media defend it , mainstream outlets dance around it , and everyone just forgets it ever happened as soon as the next news tsunami hits. Trump bringing in Fox News people is now just a regular thing. It’s commonplace to see  Fox host Jeanine Pirro in the Oval Office one day, and hear about  host Lou Dobbs phoning in White House meetings the next. Fox & Friends weekend host Pete Hegseth is rumored  to be the next Secretary of Veterans Affairs one week and is being considered  for a communications job a few weeks later. Former Fox & Friends anchor Heather Nauert was installed  at a top position in the Department of State. Former Fox contributor John Bolton became  the national security adviser. Former Fox commentator Mercedes Schlapp is the  director of strategic communications at the White House. Former Fox commentator Tony Sayegh  is a Treasury Department’s spokesperson. Former Fox commentator Richard Grenell is now  ambassador to Germany. There are also those who didn’t make it: former contributor K.T. McFarland resigned  as deputy national security adviser and later withdrew  her nomination to become ambassador to Singapore due to controversy over work for disgraced former national security adviser Michael Flynn; and contributor Monica Crowley was never hired after it was reported  that she plagiarized  parts of her Ph.D. dissertation. And there’ve been rumors at various times that Trump is considering hiring Laura Ingraham and Sean Hannity.